It’s raining Full HD smartphones this festival season and Zen Mobiles have come up with their version, Zen Ultrafone Amaze 701 FHD, which protects its Full HD display beneath a Corning Gorilla 2 glass protection and a bordering Magnesium frame which is light in weight and strong. How does this differ from other FHD phones we have seen recently? To start with it is the cheapest among the recently launched ones and comes with extendable storage option. Let’s dive a little deeper to know what this phone is offering. The Camera specs of this phone have been enhanced compared to the competition, which includes Micromax Canvas Turbo, Gionee Elife E6 and Intex Aqua i7. The phone comes with the 13 MP BSI 2 primary camera sensor which we have seen in all FHD phones. Zen has gone that extra mile and provided a 5 layer lens optics in this camera which will enhance image quality. We saw similar 5 layer lens in Intex Aqua i5 where it color reproduction was good but there wasn’t significant improvement in low light scenario. The secondary camera also has a larger sensor of 8 MP and will help with better self portraits. Its primary function is video calling and 5 MP was also apt for that purpose, you won’t get much advantage in that area. The primary camera can capture pics in horizontal and vertical panorama mode. The Internal storage is the aspect where it shines above the rest. This phone comes with 16 GB on board storage which can be further extended to 64 GB using a microSD card. Rival phones like Micromax Canvas Turbo, Gionee Elife E6 and Intex Aqua i7 don’t provide microSD card support. The phone is powered by a 1.5 GHz Turbo Quad Core processor which most likely is Mediatek MT6589T but the spec sheet refrains from mentioning mediatek at all places. The RAM capacity is 1 GB and is half of what all other players are offering. This will be of disadvantage to users who like to download loads of app and who like to indulge in high end gaming. It won’t affect other general purpose users as much. The Apps you use most often are cached in your Free RAM so that the processor doesn’t have to reload them from the SD card every time. You can further read about how RAM affects your system performance in the linked tutorial. Battery capacity is again similar to what everyone is offering and there is nothing to boast off in this arena. This phone comes with 2050 mAh battery which is just slightly above the 2000 mAh battery we have seen in the competition and will give you similar back up of around 6 to 8 hours of talk time. The display is a 5 inch IPS LCD display with One Glass Solution (OGS) technology. This eliminates space between display and touch screen which provides a better touch experience and also reduces refracted light for better outdoor visibility and brightness. The display resolution is 1080p full HD which gives pixel density of 441 ppi which ensures that the display will be crisp and sharp. 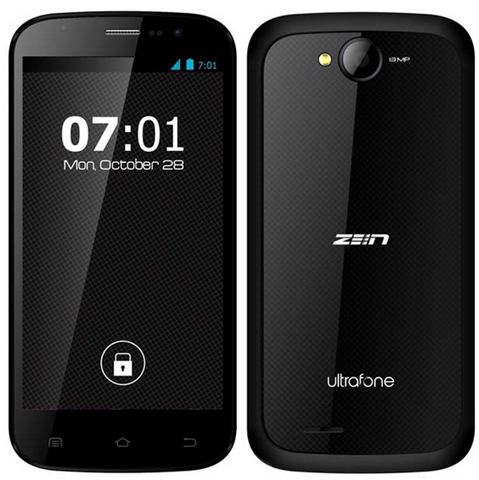 The phone supports dual SIM (WCDMA + GSM) and on the software front this phone runs on Android 4.2 jelly bean operating system. Zen has focused on the build quality and provided this phone with a magnesium frame on the edges and a textured back cover which does looks premium. Nothing much can be said as Zen has not provided with weight and body dimensions as of yet. You will also get a Smart flip cover with this phone. Connectivity features include WiFi with Hotspot, Bluetooth, 3G, microUSB and GPS with AGPS support. Magnetic senor is also present for enhanced navigation. The main competition is against slightly expensive Full HD devices like Micromax Canvas Turbo, Gionee Elife E6 and Intex Aqua i7 all of which will provide you with 2 GB RAM but won’t give you extendable storage. Micromax Canvas Magnus with HD display is also a good option which will give you similar performance at lower price. The phone comes at attractive price and sports good specifications. This is a good value for money device similar to predecessor Zen Ultrafone 701 HD. The battery will last one day with moderate usage but keep the charger handy if you wish to enjoy Videos, Movies and games on your Full HD display. The option of MicroSD card gives you flexibility to keep high resolution content to take full advantage of this display while on the move.